Swami Trigunatitananda’s actions and behaviour were unusual and sometimes not understandable to others. He had indomitable energy and was undaunted by any situation. He was sceptical about the existence of ghosts; he had visited a number of haunted houses and found nothing to substantiate claims of ghostly inhabitants. This aroused in him a determination to see a ghost, should one really exist. Someone told him about an old empty house near Baranagore Monastery where he could see a ghost at midnight. Without telling anyone, Swami Trigunatitananda went there before midnight and waited for the ghost. Suddenly he saw a faint light appear in the corner of the room. The light grew brighter until, in the centre of the light, there appeared an eye. It approached him with deadly malevolence. The swami felt his blood dry up in his veins and his body wither like a green tree before a forest fire in the sinister light of that eye. 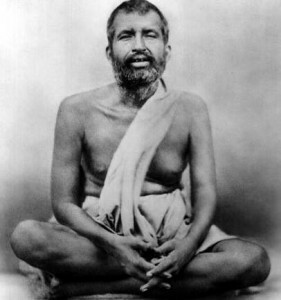 He was about to faint, when all of a sudden Sri Ramakrishna appeared. Holding his hand, the Master said: “My child, why are you so foolishly taking chances with certain death? It is sufficient for you to keep your mind fixed on me.” With those words, the Master disappeared. Trigunatitananda’s spirit at once revived and he left the house, his curiosity about ghosts satisfied forever.